The last time that I ate at Breadbar West Third, Ludo was still cooking here, so it's definitely been a while. 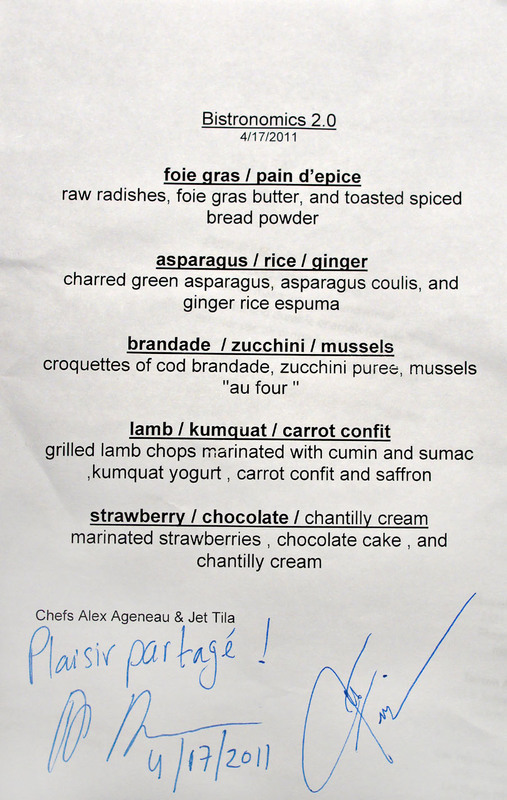 Lefebvre, of course, is oft credited for popularizing both the pop-up restaurant and the concept of "bistronomy" here in LA, and indeed, I was back at Breadbar for another pop-up: Bistronomics 2.0, running April 17th and 18th. 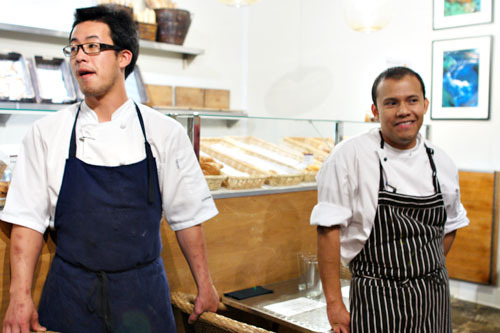 The brainchild of Jet Tila and Alex Ageneau, Bistronomics actually launched earlier this year in March. The series stresses the mantra of "economy, variety, and seasonality," meaning that the two chefs strive to present contemporary fine dining cuisine at approachable price points. Their audience will be small; in an attempt to recreate the vibe of a neighborhood bistro, the duo aims to serve only 48 diners for each of the two nights. 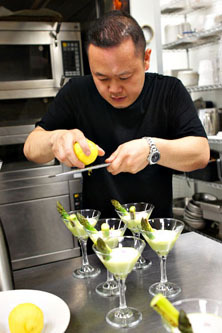 About the Chefs: A Los Angeles native, Jet Tila was born into a Chinese-Thai family, and grew up cooking by his Cantonese grandmother's side. He was further exposed to the culinary arts when his family started Bangkok Market on Melrose, one of the first Thai importers and groceries in the country, and later the Royal Thai Cuisine restaurant chain. Sensing an emerging interest in Thai cuisine, Tila started up Thai cooking classes in his backyard when he was 22, garnering the attention of the LA Times, which put the young Chef on the front page of its food section. Given the success of these courses, he enrolled at the California School of Culinary Arts (Le Cordon Bleu program), and later the California Sushi Academy, thus expanding his culinary repertoire to other global cuisines. During his studies, Tila also interned as a writer at the Times, working with Barbara Hansen and Russ Parsons. 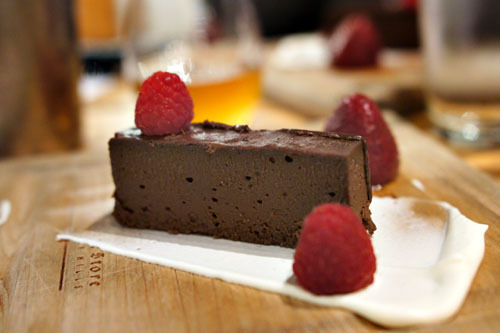 Following, he cooked at Patina, Grace, and even The Hungry Cat, where he was opening chef. Tila then went the corporate route, taking on a position at Bon Appétit Management Company and setting up Asian food operations on the campuses of AOL, Netscape, and Google. 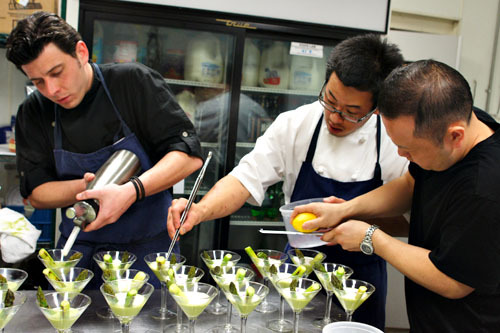 He stayed with them for five years as a consultant, and also worked as a private chef during this period. Then, in the summer of 2008, he was contacted by Steve Wynn's people to open a pan-Asian restaurant at Encore. He signed on in September that year, and had roughly three months to ready Wazuzu in time for the hotel's grand opening in December. The restaurant has been a success so far, giving Tila a chance to work on other food-related projects. In fall 2010, he debuted a frozen food line in partnership with Schwan's Home Service, and also works with Café Spice, a company that provides ready-to-eat food to supermarkets (such as Whole Foods), corporations, and colleges. Alexandre Ageneau hails from the city of Nantes, France, and started his culinary career about an hour south of his hometown, in Vendée, where he trained in the art of charcuterie at age 15. He eventually immigrated to the US in 2001, and took up a position at the long-lived Les Nomades in Chicago, then moved on to Patina, first with Eric Greenspan, then with Theo Schoenegger. Next, Ageneau worked a short stint at Pierre Gagnaire's Sketch in London, then returned Stateside to Patina. After a stage at the legendary Le Chateaubriand in Paris, he followed Schoenegger to Las Vegas in 2008, serving as his Chef de Cuisine at Encore's Sinatra. 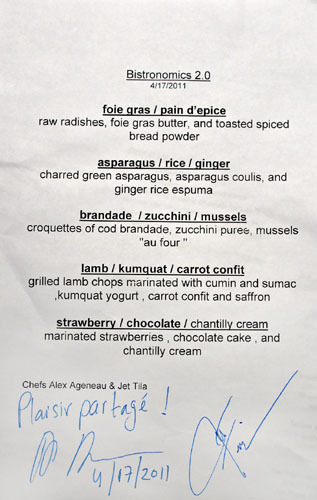 Given that both Ageneau and Tila were opening restaurants at Encore in late 2008, the two naturally became food buddies, thus setting the stage for Bistronomics. 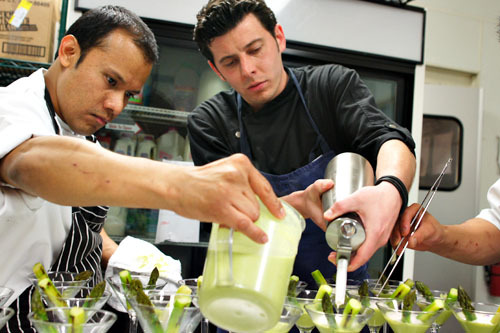 In 2010, Ageneau moved back to LA to work with David Féau at The Royce, where he currently serves as Sous Chef. 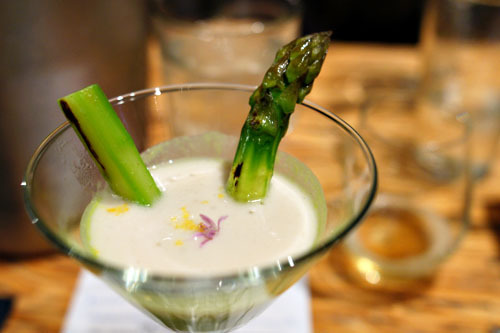 The duo's five-course prix fixe menu was priced at $65 per person, and in line with their devotion to seasonal cooking, was designed to showcase the flavors of early spring. Subtitled "play with your food," it was also utensils-optional. Click for a larger version. Our first course was inspired by Ageneau's childhood memory of eating raw vegetables in his grandparents' garden back in France. 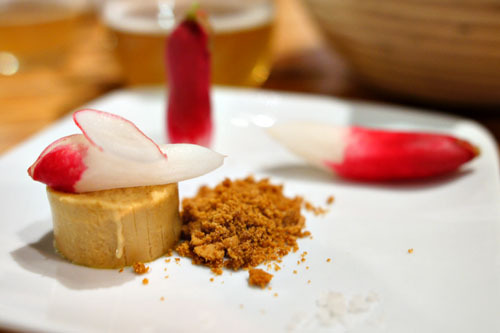 The star of the show here wasn't the foie gras, but the radish. Its bright, bitter bite quickly cut through the weight of the liver, leading to a combination of astringent, sweet, and buttery flavors finished with a prick of salt. 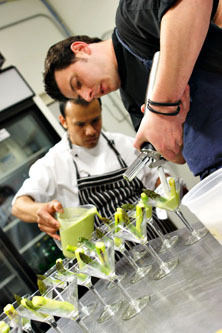 Prior to the next course, we were taken back into the kitchen to see the dish being plated. Asparagus was peeled, blanched, and charred, making for one of the best preparations of the vegetable that I've had in a while. Indeed, the asparagus was delightfully tender, with only a subtle pungency that played beautifully with the ginger-y tang of the puréed rice. Very nice. 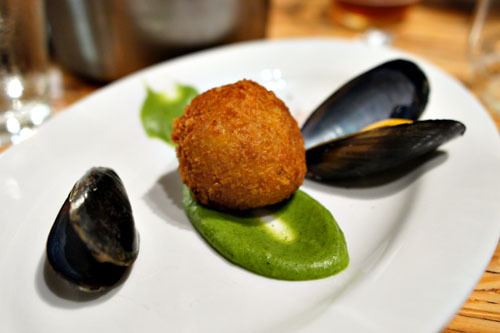 3: brandade / zucchini / mussels | croquettes of cod brandade, zucchini puree, mussels "au four"
The sphere of salt cod, as expected, arrived delectably creamy on the inside, with a lovely bit of saltiness and a very satisfying, fishy savor. It was deftly offset by the bright flavors of the zucchini, while the mussels (boiled then finished in the oven), with their pure, sweet salinity, provided a wonderful augmenting brine. Our pièce de résistance, lamb was ridiculously succulent, supple, and fatty, with a wonderful depth of flavor accented by just a touch of bitter char. The meat easily stood alone, but I appreciated the countervailing taste of the dehydrated olives used here, as well as the carrot, but the kumquat yogurt was too sweet for me. I think that perhaps a cucumber yogurt would've worked better, or maybe a spicier condiment such as muhammara. Dessert presented deep, dark, unabashedly saccharine flavors of chocolate, lightened by the chantilly and balanced by the use of strawberry and raspberry. Clean, classic flavors, faithfully presented. 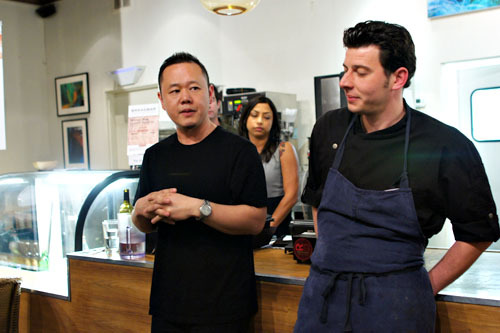 At the end of the evening, Ageneau and Tila thanked everybody for their support, especially chefs Alex Jun (Comme Ça, BLD, Grace) and Jose Colmenares (Comme Ça, Twist, Patina, L'Orangerie), who assisted in the kitchen. Glad you could make it Kevin! Deep fried cod brandade? Bouchon just called they want their appetizer back. Great pic as always. 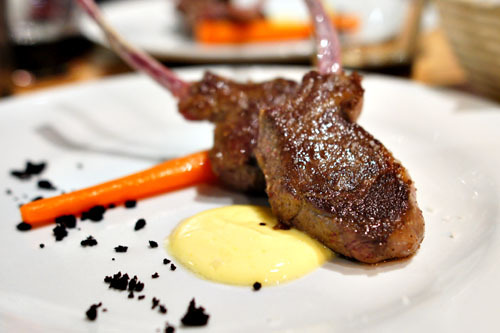 How did your lamb picture turns out so well? Mine is all dark. Haha! Darin: Thanks again for setting it up. Anon: Did asparagus and radish not just come into season? Anon: You're attributing fried brandade to Bouchon? They're hardly the only restaurant to serve that dish. Sam: The lamb itself is dark? Just try selectively brightening it.